Virginia’s Wintergreen Resort celebrated its 25th season several years ago, and although access and facilities have improved over the past 25 years, one thing has remained constant: a great location in the heart of the scenic Blue Ridge Mountains with great views. Wintergreen Mountain peaks at 4,000 feet, bringing cool summer temperatures and helping to attract and keep snow during the winter months. The resort offers 26 slopes and trails with a respectable vertical of 1,000 feet. There are 125 skiable acres, and Wintergreen features a half-pipe for snowboarders. Wide-open beginner terrain is plentiful, along with plenty of steeps to keep the experts happy. In the past decade, Wintergreen has spent over $20 million in capital improvements, including the installation of two six-passenger, high-speed lifts. The most recent “six pack” was added in 2004. In 2003, Wintergreen installed a state-of-the-art York computerized snowmaking system, which it has continually upgraded. In fact, Wintergreen began an additional $12 million project in 2012 to double its already impressive snowmaking capacity. 100% of Wintergreen’s terrain is covered by fully automated snowmaking. “We can do wonderful things with it,” said Jay Roberts, Vice President of Mountain Operations. “It’s nice to have natural snow, but our snowmaking system allows us to make snow across the mountain quickly. We have the ability to start and stop snow guns from a desktop at the snowmaking plant,” he added. Wintergreen is proud of its snowmaking system, and the quality of grooming. 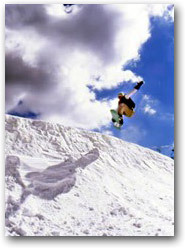 For the 2005-2006 winter season, Wintergreen added Outer Limits, a new trail in the Highlands area. A brand new beginner area debuted at Wintergreen for the 2006-2007 winter season, featuring new beginner-friendly conveyor lifts. The Treehouse provides kids with their own ski area and 90-foot conveyor lift. For the 2010-2011 winter season, Wintergreen added Ice Skating, a new Learning Conveyor Lift, new rental equipment and more snowmaking power. Wintergreen also has two tubing parks, including Virginia’s largest. One park offers a gentler ride, while the other offers hair-raising runs reaching 25-40 miles per hour. Photos provided by Wintergreen Resort. Terrain Park: Two terrain parks, with snow features, jibs, and rails. Tubing Park: "The Plunge" Tubing Park has ten 900-foot long lanes with a 100 foot vertical drop. "The Slide" Tubing Park has gentler, more tame downhill runs for ages two and up. Much too warm for snowmaking right now. Weather supplied by the National Weather Service. Errors or reporting delays may be possible. December 20, 2018 - Early-season cold temperatures enabled many Mid-Atlantic resorts to fire up the snowguns, but the cold gave way to some bouts of milder temps and heavy rain, which has delayed the start of the season for some resorts. Although pre-Christmas rain is still adding to the challenge, several additional resorts plan to open in the coming days. December 28, 2017 - On December 20, 2017, Liftopia announced its Second Annual Best in Snow Awards, and Mid-Atlantic ski area Canaan Valley Resort received top billing in two categories. December 14, 2017 - The past week saw the arrival of cold temperatures, and the dip in Mercury allowed ski areas to fire up their snowguns. Although lifts have already started running at several resorts, by the end of the December 16-17 weekend nearly every ski resort in the Mid-Atlantic will have kicked off its 2017-2018 winter season. DCSki has the latest opening information here. Distressed about the Lack of Snow? DCSki Presents Pictures of Snow. December 23, 2015 - There was once a time when it snowed in the Mid-Atlantic in December. Sadly, this is not one of those years. On Christmas Eve, temperatures are forecast to reach the mid-70s — possibly smashing records. As a public service, and to help you get through the next couple snowless weeks, DCSki presents this series of photos showing snow. February 14, 2015 - Connie Lawn and Charles Sneiderman recently participated in the 11th Annual Wounded Warrior Weekend at Virginia’s Wintergreen Resort. They provide this Firsthand Report. Note: Webcam images may not be up to date. View Wintergreen's official webcam page. See you at Wintergreen/Massanutten this weekend? One night rentals at wintergreen? What's up with Wintergreen's Highlands trails not being open yet?